Following recent success managing common carp in the Phalen Chain of Lakes, we are now setting our sights on the Lake Owasso system. With four interconnected lakes (Owasso, Wabasso, Bennett and Grass) and twelve shallow ponds, the system offers prime habitat for carp to potentially out-compete native gamefish, uproot aquatic vegetation and harm water quality. Carp management in Lake Owasso and connected lakes is part of the District’s goal to control phosphorous-loading in these waters. As carp root for food along the lake bottom, they stir up phosphorous-laden sediment, which in turn contributes to turbid water and algal blooms. The key to keeping carp in check is figuring out how many there are, where they go, and how they spawn and recruit (survive to adulthood). Using this information, we hope to efficiently remove large numbers of adult carp while also limiting their ability to repopulate the system. The District enlisted Jordan Wein of Carp Solutions to conduct a general population assessment through electrofishing this summer. After calculating a biomass estimate, they found that each lake in the chain contained more than 100 pounds of carp per acre, the threshold generally considered to inhibit water quality. Most concerning were Lake Owasso and Lake Wabasso, which each turned up more than 400 pounds of carp per acre. The team also marked over 200 carp with a fin clip as part of a mark-and-recapture study to verify these estimated population numbers. “We’re being strategic by marking the carp now so that when we eventually harvest them, we’ll be able to get a good estimate of how many were in the lake,” explained Bill Bartodziej, District natural resources specialist. 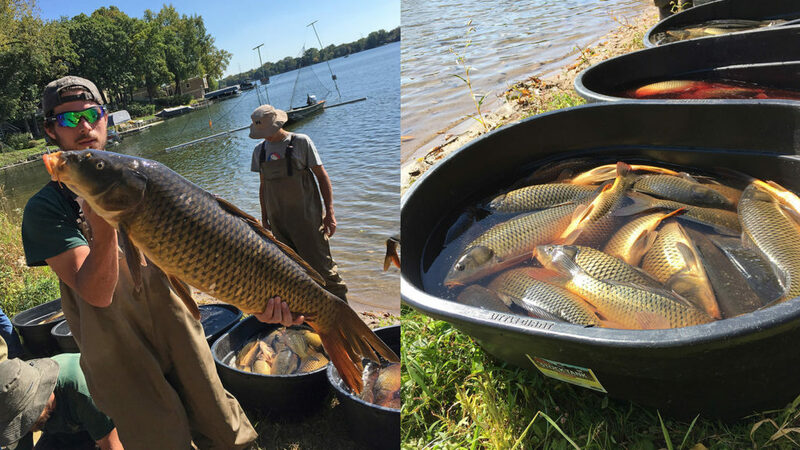 The team used box nets baited with corn to capture large numbers of carp on Lake Owasso. Twenty adult carp were implanted with radio tags to help us track seasonal movements and develop a control strategy for the Owasso system. In addition to the population assessment, Carp Solutions surgically implanted radio transmitters in 20 adult carp to figure out where they congregate in the winter and where they spawn in the spring. Since carp tend to travel in dense schools, the radio-tagged fish will likely betray their rubber-lipped brethren and help the research team track seasonal movements of the larger population. At 37 feet deep, Lake Wabasso is likely an overwintering hotspot for carp. Using radio telemetry to pinpoint locations where thousands of carp school up under the ice, the District plans to enlist a commercial fishing operation to harvest these fish with large sein nets. While netting adult fish should put a dent in the carp population, confirming spring spawning locations could be key to a long-term management strategy. 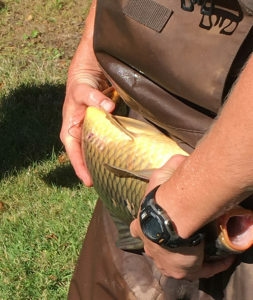 “It’s very unikely that carp are successfully reproducing and recruiting in Wabasso, so they are probably spawning elsewhere in the system,” said Wein. Bluegills are voracious predators of carp eggs and tend to control numbers of young carp in large lakes. However, shallow ponds and wetlands often serve as carp nurseries where they can hatch by the millions and grow in relative safety from predators. Future management strategies may include setting up barriers to keep carp out of these nursery areas, netting them there and/or stocking bluegills to eat the carp eggs. Over the last five years, District carp management in the Phalen Chain has reduced carp density by over 60 percent. Among those efforts was eliminating carp in Lake Casey (a former carp nursery in North St. Paul) by drawing down the water level, allowing carp to winterkill, and then stocking bluegills and largemouth bass. Tracking the movements of Owasso carp could help identify similar carp nursery locations and allow us to rein in these prolific fish.